Today, I welcome my mentor to Casual Conversations. She works with Proverbs 31 Ministries, is an ECPA best-selling author, speaker, blogger and the one I stalk and call "my friend" to my gal pals. She is authentic, a big lover of Jesus, and walks into the deep each day to spread The Hope to women who need to know they are seen and loved by God. She is amazing, and my heart leaps for joy as I write the next few words: Please welcome my friend, Suzie Eller, to Casual Conversations. Last Friday, Suzie and I had a casual conversation, and it was so dreamy. It was easy, and it was fun. It was also Suzie's birthday, yeah! Although, it was her birthday I was the one who received a gift. Thank you, Suzie. As you listen to our conversation in the following video, please pay close attention to the really special way Suzie is promoting her newest devotional, "Come With Me: A Year of Walking With Jesus", which releases on Tuesday, September 19. The promotion is an out of the box idea and terrific. I am very excited about it; I hope you will be too. 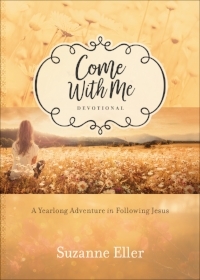 Buy One Give One: Suzie is stepping into the deep with the way she is promoting her new devotional, "Come With Me: A Year of Walking With Jesus." You buy a book, send Suzie the receipt to comewithmedevo@yahoo.com, and she will give a devotional to a beautiful woman in need. She will write a personal note in your name and send it with the book. How awesome is that?! My excitement about the offer has moved me to action. 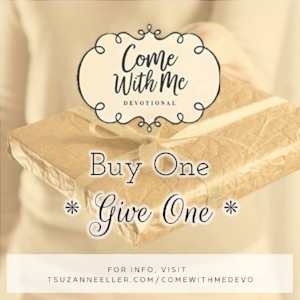 For the first 20 woman who send a receipt to comewithmedevo@yahoo.com from Friday, September 8 to Friday, September 15, I will match Suzie's offer. So, TWO women will receive a book in your name. Make sure to send Suzie the message you want her to write on the card along with the image of your receipt. Giveaway: September's Giveaway is big, it is a bundle, and it is beautiful. 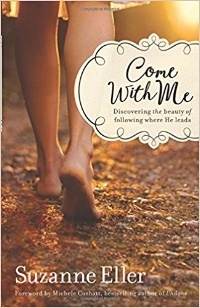 Leave a comment below or on Casual Conversations Facebook page and you might win Suzie's, "Come With Me: A Year of Walking With Jesus", "Come With Me: Discovering the Beauty of Following Where He Leads", and "Come With Me DVD: Discovering the Beauty of Following Where He Leads". Yes, all three! Why? Because this study changed my Christ-walk and I want it to do the same for you. I will announce the winner by next Friday.